If you’re not properly prepared, a flat tire can quickly pump the brakes on your road trip high, leaving you stranded on the side of the road instead of purposefully parked on a sandy beach. Before departing for a summer road trip, complete KFB's check list to help you avoid getting a flat on the road. You’re cruising down the freeway, suitcases in the trunk, radio blastin’ and windows down. You’ve made it about 45 minutes into your 10-hour trek to the beach and thump, thump, thump. Flat tire. Before departing, complete this check-list to help lessen your probability of getting a flat. Your tires have a recommended PSI, or “pounds per square inch.” To find the optimal PSI for front and rear tires, check in the driver’s side doorjamb, glove compartment or the owner’s manual. Note that front and rear tire numbers may differ. If you’re having trouble finding this number, consult your dealer, manufacturer or a tire professional. Once you know the recommended PSI, check the pressure on “cold” tires (this means check the pressure in the morning or after the vehicle has been sitting for several hours; tires that have been driven for more than a few miles warm up and cause the air pressure to increase). Many gas station gauges can be several pounds off, so it’s recommended to buy your own tire gauge. You can find them at most auto parts and big box stores for anywhere from $5 to $15. When it’s time to check the pressure, remove the cap from each tire’s inflation valve. Insert the end of the gauge into the valve and depress it. If you hear air escaping from the valve, push the gauge in further until it stops. Voila! Your gauge will then give you a pressure reading. If the pressure is too low or high, adjust accordingly using these step-by-step instructions by Consumer Reports. Tires with worn or no tread are at a higher risk of a blowout or flat. The U.S. Department of Transportation recommends replacing tires when the tread reaches 2/32”. Checking the tire tread is a cinch, as most tires have built-in indicators. These indicators are simply raised sections of rubber in the bottom of tread grooves that will appear when it’s time for a replacement. Don’t trust the indicators, or want to do it the old-fashioned way? You can use a penny! 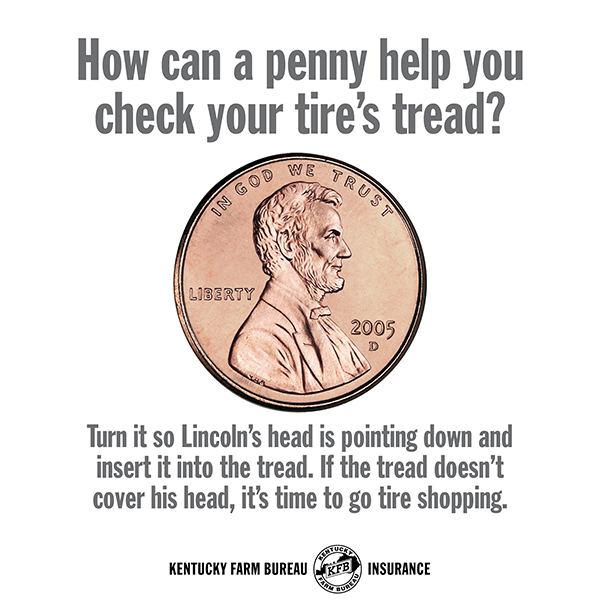 Turn the penny so Lincoln’s head is pointing down and insert it into the tread. If the tread doesn’t cover his head, it’s time to go tire shopping. Think it’s safe to assume there’s a spare in your trunk? Think again. 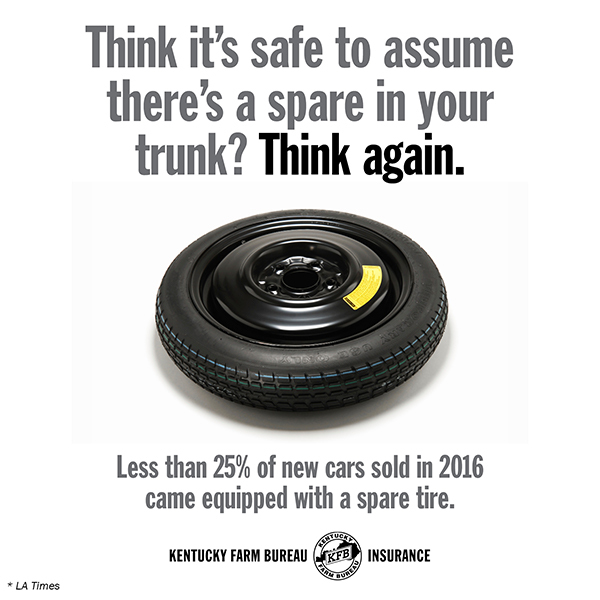 Less than 25% of new cars sold in 2016 came equipped with a spare tire. The donut in the trunk is quickly becoming a thing of the past. To improve fuel economy, automakers are using a repair kit to replace a full-size spare, wrench and jack (which can weigh up to 100 pounds combined). If there is a spare: Great! Check its pressure and tread as detailed in the steps above. Keep in mind that many tire manufacturers say tires expire after about a decade, regardless of whether or not they’ve been used. If you have never changed a tire, a practice run might be a good idea. You wouldn’t want to get stage fright on the side of the road! If there isn’t a spare: Educate yourself on how to properly use the equipment provided. Most newer cars provide a tire inflator or repair kit in place of the spare. In short, these kits inject your tire with sealant and replace lost air. Pack some roadside emergency essentials. 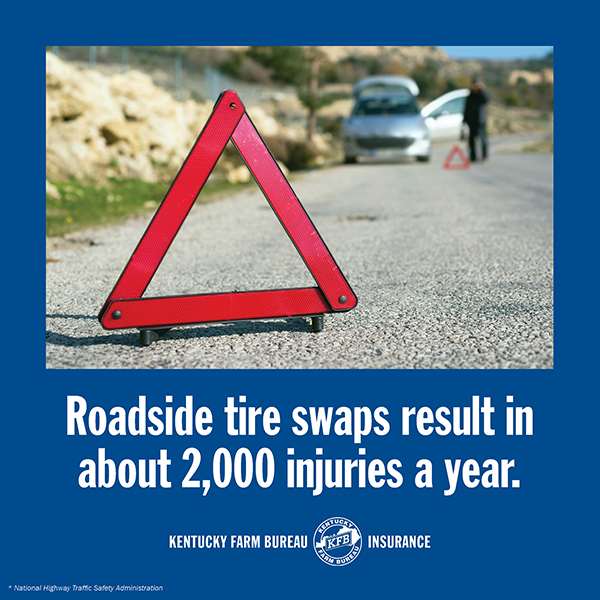 According to the National Highway Traffic Safety Administration, about 2,000 injuries a year result from roadside tire swaps. It’s imperative to warn other drivers that you’re laying on the side of the road as they whizz by you at 70 mph. Pack some flares or reflective triangles! Make sure you’re charged up. Charge your phone before heading out, and pack a portable charger if that is an option. Hopefully after completing this check list you won’t need to call for help, but in the event you do, there’s nothing more detrimental than a dead cellphone battery on a lightly traveled highway. 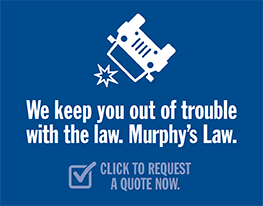 >> We want you to be safe out there on the road… but accidents still happen. At Kentucky Farm Bureau, we’ve got agents in all 120 counties. Click to find one near you.